On Monday 29th June, Week 10 of Term 2, Brooke and I worked together as partner on our Science Fair Project. We chose to do our project on fingerprints. On Monday 20th July, Brooke and I received our Science Fair Assessment sheet. Our overall score was 70/100. 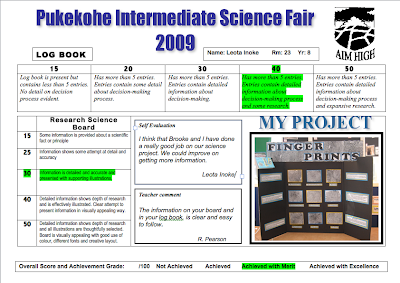 This is a screen capture of our finished science fair assessment sheet.